To me, each January seems long and cold, and a bit of a letdown after the holidays are over. This year seems to be no different. I don’t think it helps that it’s also the month when the IRS starts accepting tax returns. In case you were wondering, this year the date they begin accepting them is January 28, 2019. That’s a little early for my husband and I to get ours sent in, though. Since we own a farm, it usually takes us a little longer to get them figured by our accountant. Unfortunately, it’s also expensive. Don’t get me wrong, our accountant is worth every penny we spend each year. At the same time, it always feels a little like the money is going down the drain. But my point isn’t to spread gloom and doom. You don’t have to get completely depressed about what it costs to have your own taxes done. There are ways to pay less to have your taxes done instead. Obviously, if you have the know-how and the patience, you can figure your own taxes. That’s one sure way to have your taxes done and pay less for this service. Of course, if you lack the time or are a procrastinator by nature, this might not be the best option. Trying to save a little money in this way could backfire. You might end up filing for an extension. Worse yet, it could make you late turning in your taxes and result in late filing fees from the IRS. That being said, you should carefully weigh this decision before taking on this task yourself. In addition, make tax time more tolerable by preparing ahead of time as much as you can. If you don’t know how to do your own taxes, you could have your taxes done by a friend. Asking a friend who is knowledgeable in tax law could save you a bundle. Still, not all friends would be willing to go this extra mile for you. After all, their information is going to be on the return as the preparer as well. So, they have to be willing to take the heat if they mess up on your tax return. Therefore, rather than expecting your friend to do your taxes completely free, you could offer to pay them. Offer at least a little bit of money for their time and expertise. Or, ask if you can do some other service for them as a trade for doing your taxes. Another idea to try to have your taxes done for less is to get a relative’s help. When you’re lucky enough to have one who doesn’t mind helping, ask them to lend you a hand. Keep in mind that if you have a business, you might not want your relative’s help with your taxes. For one, you might not want them knowing your business details. For another, it might get too complicated. In that instance, it might be better to hire a tax attorney. Again, you can offer to pay your relative for their time, or compensate them in some other manner. 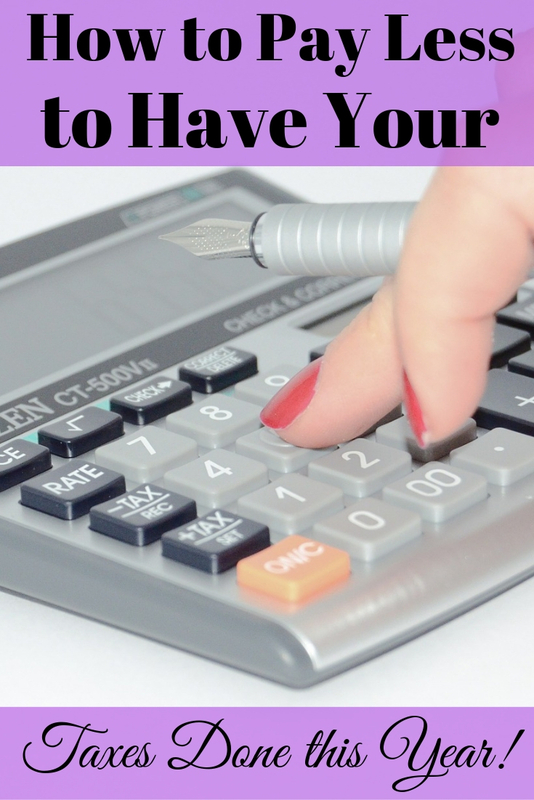 How you work it out is up to you, but it can help you have your taxes done for less money. Did you know you can get your taxes done absolutely free? According to the IRS, you should never pay to have your taxes done. I’m sure that’s not necessarily true in everyone’s case. But for some, there are certainly ways to have your taxes done for less. Credit Karma Tax is one way you can get your taxes done for free. They guarantee accuracy and can help you out if you get audited. You don’t have to be stressed out that tax time is here. Clearly there are several ways you can pay less to have your taxes done and ease your anxiety about it. Try some of these options to save money and get your taxes done on time. How will you get your taxes done this year? Thank you so much for your valuable information. It really helped me a lot. I got so much information about taxes, and now I am going to read your next post. Thank you so much. This is a nice post. Keep up the good work. I feel getting my taxes done professionally is the best option, that way, I don’t risk tarnishing any personal relationships. I went to Heronwealth last year in Manhattan and the financial adviser was both affordable and efficient. I will definitely be going back next year. That’s great! I’m glad you found an affordable option. 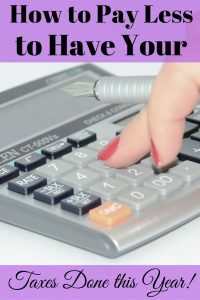 Depending on the complexity of your finances, having your taxes done professionally can cost a bundle! I just think it’s a good idea for people to shop around and look at all the options before spending a ton on it when they might not have to. I wish you the best in the future, financially and otherwise. Thanks for commenting! Wow! Today I came to know about Credit Karma Tax. I will surely be using them from now on. I have always found taxes very confusing. I hope this will make my taxing journey easier now. Thanks for the great content as always. Yes, taxes can be very confusing. It’s always a good idea to consult a professional if you have questions. That way you ensure you are completing them accurately and not under or overpaying.